I’ve followed behind hundreds of parts changers. I’ve become all too familiar with the madness of their method. 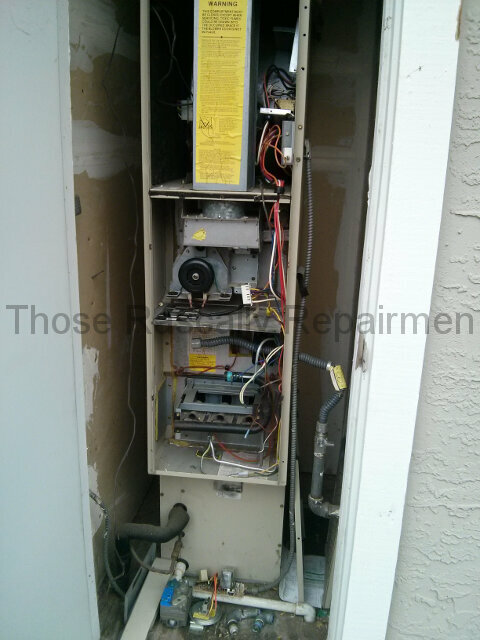 Through trial and error they learn which part usually causes the furnace’s or air conditioner’s symptoms. They quote the homeowner to replace that “usual part” and install it. If the broken unit starts to work, they assume their educated guess was right. If it doesn’t, they move on to the next part and inform the customer that they found a second problem while fixing the first. Cha-ching. Quite often the parts changer’s first guess is right. 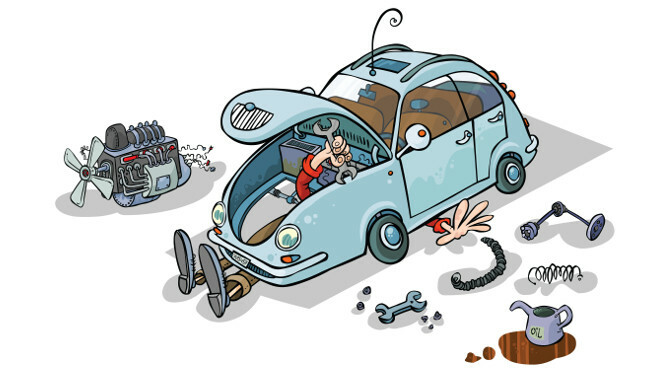 There are certain failures that every repairman sees dozens of times per year. Naturally those problems and their solutions become very familiar. If it turns out his first guess is wrong, the parts changer will then call the boss or tech support or whomever he needs to in order to get it right the second time. After all, “finding” a third problem would stretch credulity. But what if his second, third, fourth and fifth guesses are all wrong? A once and future customer of mine learned the answer to that question. His furnace stopped working. Though he was pleased with my previous work, he decided to give Hygienic Heating & Air a try because they happened to be right next door working on the neighbor’s furnace. It didn’t turn out so good, so he called me. 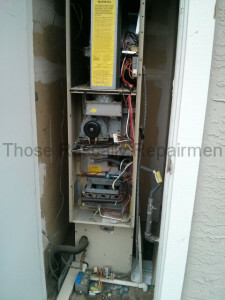 The picture below shows the furnace as I found it. The old gas valve, vacuum switch, main circuit board and inducer control board were sitting on the closet floor. The pilot assembly, still in place, was new. And, interestingly, the instructions for installing a new inducer control board were sitting to the right of the furnace. 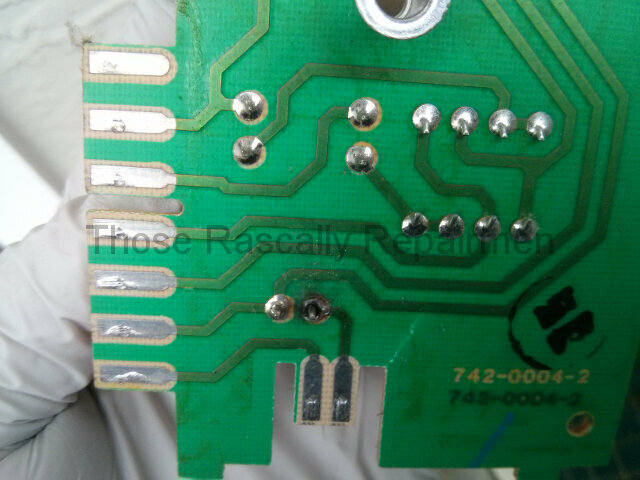 I inspected the loose parts and saw a burned spot on the back of the inducer control board (a relatively simple miniature circuit board). Look closely and you’ll see it. So what happened? 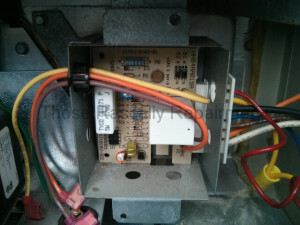 My guess is that Hygienic’s repairman took four potshots at the problem and so replaced four parts: the pilot assembly, the vacuum switch, the gas valve and the main circuit board. 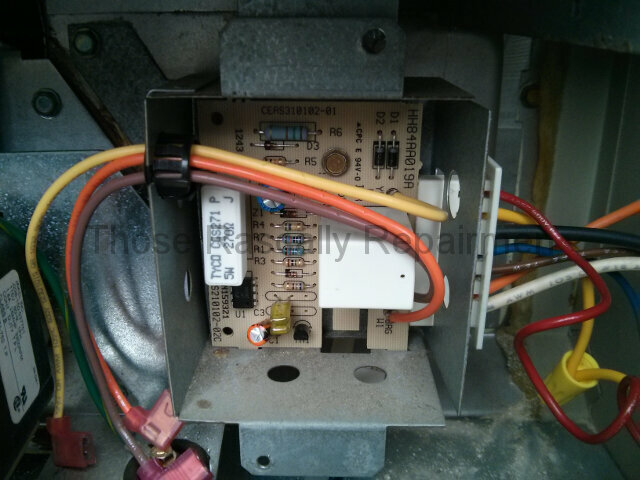 The furnace still didn’t work, so he moved on to the inducer control board. After removing it he saw the burned spot and knew his fifth potshot would finally hit the target. Even though he finally knew which part to replace, he stopped short of replacing it. Why? Probably because parts changers rely on the new and old parts being exactly alike. While the other four parts are exactly alike, the new inducer control board is not exactly like the old one. It requires installing the red wire (that I installed) pictured at the top of the connector and running it to another part of the furnace. Installing that wire isn’t particularly hard if you’re a real repairman who can read instructions. But if you’re a parts changer then the instructions, which were sitting on the furnace closet floor when I arrived, are a confusing jumble of words. I say their repairman stopped at the fifth part, but that’s not entirely true. He worked his way up to the ultimate part and told the homeowner he needed to buy a whole new furnace for thousands. I installed that new board and got the furnace running like a champ for $520. It would’ve been a hundred dollars less had I not needed to clean up Hygienic’s mess.